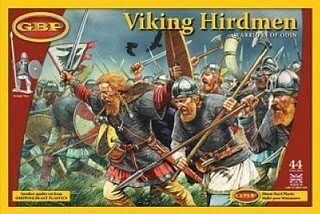 Contains parts to create 44 Viking Hirdmen armed with a variety of weapons including the fearsome Dane Axe. Also included are parts to turn up to two of your warriors into Viking Lords and up to two into horn-blowers. The instruction sheet includes 4 full-colour paper flags for you to cut out and attacg to spear armed hirdmen. Box includes a sprue of plastic bases to mount all 44 figures.